But remember, no glass allowed on the beach! THE intense summer sun has returned and it is hot outside. It's the familiar thick, humid heat that only Southerners can truly understand. Luckily, Savannahians have easy access to the beach and the minor reliefs that a coastal breeze and a quick dip in the ocean can provide. With the sand between your toes, the roar of nearby waves and a pair of cheap sunglasses, only one thing is missing: A cold beer in your favorite koozie. With more craft beer choices available on store shelves than ever, deciding which beer to pack for a relaxing day at the beach can be overwhelming. 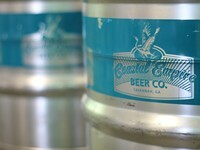 You can depend on the following beer styles for refreshment and enjoyment for your next day spent on the coast. All of the recommendations below are available in cans for easy beach transport. Strongly-hopped beers may seem like a less-than-ideal beverage for a day baking in the sun, but for hop heads who need a fix, IPAs with orange, tangerine and grapefruit flavors make a great compromise. Hi-5 IPA from Athens, GA brewery Terrapin is a perfect example. If the surfing turtle on the bright orange label wasn't enough of a tip off, this West Coast style IPA was made for active beach days. After the citrus crush provided by five different hops used during the boil and an equally intense dry-hopping period, Hi-5 finishes with a crisp honey-malt sweetness. If the bitter bite of hops isn't your idea of a summertime sipper, Oberon from Bell's Brewery provides a less complicated form of refreshment without sacrificing great taste. Oberon's flavor profile includes a mild fruitiness, touch of spice and a smooth, easy-drinking mouthfeel. It's only available from March through Labor Day, timed to coincide with the summer drinking months. 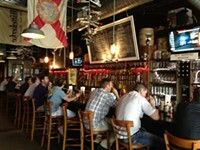 For more fruit bite and a closer-to-home option, try Whabbit Wheat from Marietta's Red Hare Brewing. This new release is brewed with apricots and peaches to enhance a traditional wheat beer base. 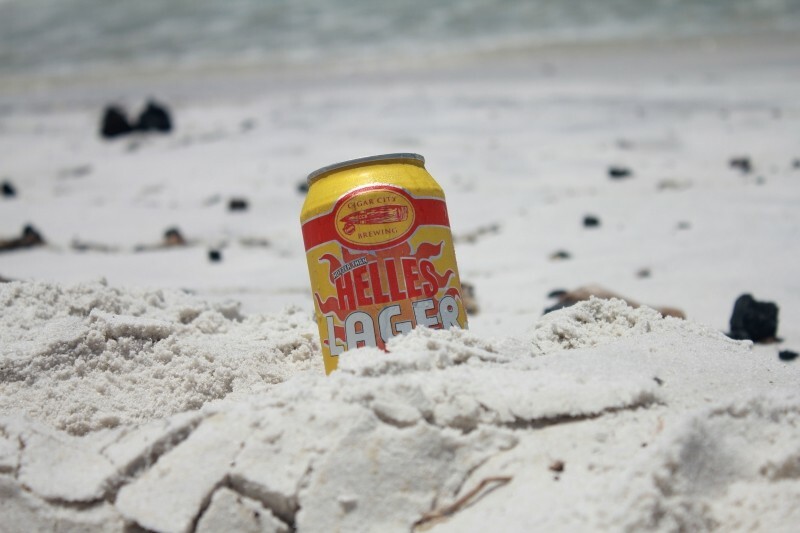 The Cigar City Brewing beer Hotter Than Helles was named for a weather pun that alludes to the temperature outside, not the spiciness in the can. Helles is German for "light colored" and the style was named to separate this Munich-born beer from its darker-hued counterparts. Cigar City's take is traditional with a light hop bitterness, sweet malt flavor and a floral aroma that promotes complexity and repeat drinking. Lagers like Hotter Than Helles are a great choice for mixed groups where non-craft drinkers will be pulling from a shared cooler. 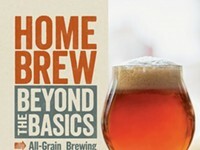 It will be a familiar, if more flavorful brew for those branching out from the Buds and Coronas more commonly seen up and down the sandy beaches. Atalanta is from one of Georgia's newest breweries, Orpheus Brewing, and is a welcome addition to the growing list of state-brewed canned beers. Atalanta is billed is a "tart plum saison" and that is a perfect three word description. In addition to that quick sour punch, there is also a bit of saltiness and the traditional yeast-forward saison character that makes this beer unique and a fun diversion from more bland warm-weather brews. If a more typical saison, with notes of lemon, orange and banana, tinged with a bit of black pepper is more your thing, you can't go wrong with Orpheus' other canned saison, Lyric Ale. No matter which beer you select, be sure to also choose the proper receptacle. Glass at the beach is against the law, so stay away from traditional bottles and instead opt for aluminum cans. Cans are also lighter than bottles for easier packing in and out to take home and recycle. If drinking a more limited release draft beer on the beach is more your style, transport it in a bullet-style plastic growler, available at The Beer Growler in downtown Savannah. Serve in a red solo cup and your beach reprieve will be complete.